The Witter and Mead families have been connected to the State of Wisconsin and to the University of Wisconsin since before the notes of “On, Wisconsin” were ever heard. For more than a century, the university’s expansion and achievements have played like an accompaniment to the accomplishments of the industrialist family that developed the coated-paper industry in the state and the nation. This fall, their 64-year-old Mead Witter Foundation commemorated that long and mellifluous history with a $25 million legacy gift to the University of Wisconsin. An artist’s depiction of the new School of Music building, which will contain the Mead Witter Foundation Concert Hall and is scheduled for construction beginning in late 2016. The school will be renamed the Mead Witter School of Music. 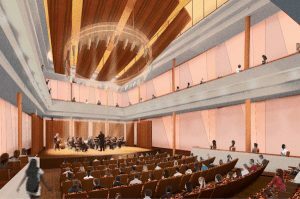 The gift will provide major funding for the UW-Madison School of Music’s new performance building, sited at the corner of University Avenue and Lake Street and scheduled to begin construction in late 2016. In appreciation of the gift, UW-Madison will name its music school the Mead Witter School of Music, and the large concert hall within the performance building will be known as the Mead Witter Foundation Concert Hall. “Chancellor Blank enthusiastically and effectively took the lead in procuring the final pieces of funding to complete the now much larger $55.8 million project, complementing the gifts of the two major donors,” Mead says. The music performance center had its beginnings in 2007 when the Hamel family of California pledged $15 million toward Phase I of the project, and in 2014, the UW announced it would name the new building the Hamel Music Center. “The University of Wisconsin System, particularly the University of Wisconsin-Madison, has touched the lives of dozens of Mead and Witter family members through their studies at the UW. The UW impact has also affected probably thousands of our employees and their children who have attended the UW since Consolidated Water Power Company began in 1894,” Mead says. In addition to chairing the Mead Witter Foundation, he was the fourth-generation leader of the corporation that his great-grandfather J.D. Witter began and his grandfather George W. Mead I built to be a world leader in coated papermaking. Witter came to Wisconsin in 1850. He amassed his fortune from banking, timber, manufacturing and hydropower on the Wisconsin River. Having the highest regard for education, he sent his two children, Isaac and Ruth, to the University of Wisconsin. They were the first generation in the family to receive a college education, and it was at the UW that Isaac met George W. Mead I, who graduated in 1894. Several years later Isaac introduced George to his sister, Ruth. Ruth and George eventually married, and when her father died unexpectedly in 1902, George took over the waterpower and papermaking enterprise. “My grandfather George had the greatest connection to the UW. He served as a University of Wisconsin regent from 1928 to 1939, and in 1950 the university awarded him an honorary doctorate. Our legacy gift is in honor and commemoration of the Mead and Witter ancestors whose hard work, along with the hard work of our tens of thousands of employees over the last century and a half, generated the prosperity that allowed for this gift,” Mead emphasized. The University of Wisconsin was chosen for the gift, Mead says, because it would have the greatest impact for the greatest number of Wisconsinites. “The Mead Witter Foundation attempts to find projects which enhance the well being of the people of Wisconsin. We have invested heavily in higher education, both through student scholarships and institutional support. We also have a history of helping libraries. Many environmental projects, ranging from the 30,000-acre, state-owned Mead Wildlife Area to the reintroduction of the whooping crane, have received assistance,” Mead says. At the UW, the Mead Witter Foundation also supports scholarships and professorships in engineering. The foundation was a contributor to the recent Chazen Museum of Art addition, as well. Organized in 1951 as the Consolidated Civic Foundation, the foundation, based in Wisconsin Rapids, has provided more than $67 million in support to colleges, universities, civic organizations and other charitable organizations. The new performance facility is designed by Holzman Moss Bottino Architecture of New York, in partnership with Strang Architects of Madison. Acoustic design is by Richard Talaske/Sound Thinking of Oak Park, Illinois, and theatrical design is by Fisher Dachs Associates of New York. The center will open in 2018. 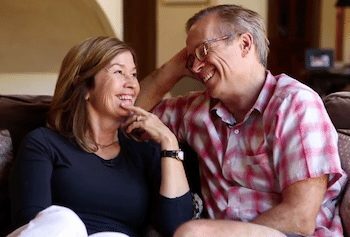 The University of Wisconsin announced Friday, December 5, 2014, that the new music performance center at the corner of Lake Street and University Avenue will be named in honor of UW-Madison alumnus George Hamel (BA’80, Communication Arts) and his wife Pamela Hamel. The new recital hall in the soon-to-be-constructed Hamel Music Center. The Hamel Music Center, whose name was approved Friday by the UW System Board of Regents, honors the Hamels who provided the $15 million lead gift to construct the new facility. The center will include a 315-seat recital hall, large rehearsal room and spacious lobby while anchoring a highly visible corner of campus in the university’s East Campus Gateway, which includes the now-completed Chazen Museum of Art expansion, the Memorial Union renovation, the Library Mall reconstruction and the planned Alumni Park on Lake Mendota. Construction on the new center is set to begin in late 2015. The Hamels’ lead contribution to the $22 million project comes as the university prepares for an upcoming comprehensive campaign, which is currently in the planning phase. In addition to their service on advisory boards across campus, George and Pam are members of the campaign planning committee. The Hamel Family, which includes three generations of UW-Madison alumni, has supported the university through gifts to athletics, scholarships, facilities and faculty support. George is a founder of ValueAct Capital, an investment management firm in San Francisco, and the family owns and operates Hamel Family Winery in Sonoma, Calif., whose badger logo honors their family’s UW-Madison roots. The center will include a glass-walled lobby, clerestory windows in the recital hall, along with a dramatic glassed-in corner of the rehearsal hall that will allow passersby to see the on-going rehearsals. Such extended transparency will help create educational and social connections between working musicians and the public, a key priority for the School of Music. In addition to providing a professional space for budding musicians to practice and learn, state-of-the-art audio-video technologies in the recital hall will allow for live-stream concerts and high-quality recordings. The new building is designed by Holzman Moss Bottino Architects of New York City, in partnership with Strang Architects of Madison. Acoustic design is by Richard Talaske/Sound Thinking of Oak Park, Ill., with theatrical design by Fisher Dachs Associates of New York City. An artist’s rendering of the proposed new music performance building, as viewed from University Avenue. This sketch shows the proposed rehearsal space with translucent walls at the corner. 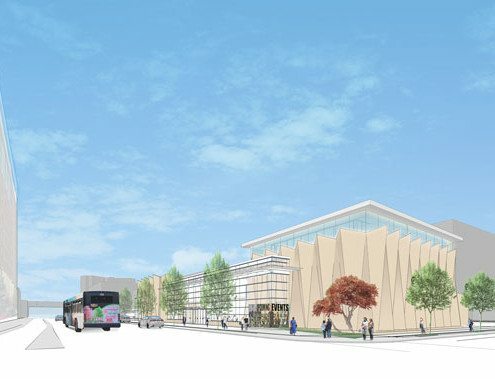 The University of Wisconsin-Madison’s School of Music is moving ahead with plans to construct the first phase of a new performance center at the corner of Lake Street and University Avenue. Architects will appear before the City of Madison’s Urban Design Commission Oct. 1 to present drawings for a 325-seat recital hall, large rehearsal room and spacious lobby. The $22 million project is entirely funded by anonymous donors. The new performance building will anchor a highly visible corner of campus and is a critical component of the university’s East Campus Gateway renovation, which includes the now-completed Chazen Museum of Art expansion, Memorial Union renovation, Library Mall reconstruction and the planned Alumni Park on Lake Mendota. More than 160 events were staged last year in the current recital hall, known as Morphy Hall, including concerts by faculty, guest artists, small chamber groups and student recitals. The school currently enrolls approximately 300 music majors, both undergraduates and graduates. The new building is designed by Holzman Moss Bottino Architects of New York City, in partnership with Strang Architects of Madison. Acoustic design is by Richard Talaske/Sound Thinking of Oak Park, Ill., with theatrical design by Fisher Dachs Associates of New York City. Noteworthy design elements include a glass-walled lobby and rehearsal room, allowing passersby to view rehearsals. Such extended transparency will help create educational and social connections between working musicians and the public, a key priority for the School of Music. “Both the recital hall and large rehearsal room are central to our educational and curricular missions and will provide our students — majors and non-majors alike — with the spaces they need to experience music as practitioners and audience members,” says Susan C. Cook, director of the School of Music. Architects have also proposed a translucent, multicolored glass brick clerestory to provide natural light, a recording suite to capture performances in both the rehearsal room and recital hall, and multi-channel audio and high-definition video recording and streaming capabilities. A “green room” lounge and dressing rooms are also planned. Exceptional acoustics have been a priority since the project’s inception, and the site — a particularly noisy stretch of campus — presented a challenge for designers. 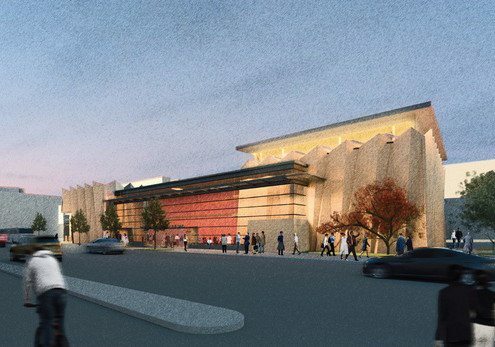 Plans call for double-concrete walls and a double-concrete roof to block exterior noise. Inside, the cooling and heating system will be placed beneath the lobby to prevent those sounds from reaching the concert hall. “Within the recital hall, patrons could experience the quietest space on campus,” says acoustics consultant Richard Talaske. 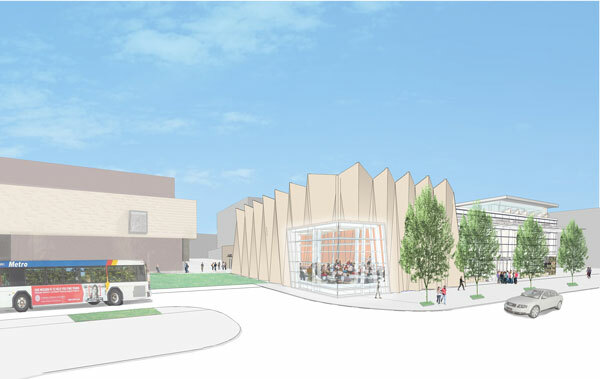 An artist’s rendering of the proposed new music performance building, as viewed from the corner of Lake Street at University Avenue. The School of Music Performance Center is part of a larger plan to replace outdated and inadequate performance facilities in the Mosse Humanities Building. In addition to providing a professional space for budding musicians to practice and learn, modern audio-video technologies in the new building will allow for live-stream concerts and high-quality recordings. The second phase of the project will include a full concert hall to seat 800 patrons (fundraising for this phase is not yet complete). The first building will be designed in a modular U-shape into which the larger concert hall will eventually be placed.